The next five reviews on Storypath will feature books based on hymns or as in the case of the book below, based on singing praise. These books will then be incorporated into a five session curriculum series on praising God. Be sure and follow Storypath on Facebook, and to subscribe to email updates so you won’t miss everything that’s coming in the next few weeks! SING PRAISE is out of print but Amazon and Barnes and Noble both offer used copies for sale. You can also check Alibris and ABEBooks for other available copies. 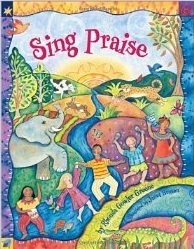 Summary: A joyful expression of praise based on Psalms 148 and 150, this book is filled with lyrical text and brightly colored pictures that dance off the page and inspire readers young and old to sing, dance and give praise to God our Creator! Literary elements at work in the story: Rhonda Greene uses rhythmic prose (frogs on logs hum jug-a-rum) to sweep the reader into the splendor and majesty of God’s creation in an musical way that makes you want to sing and dance along with the animals and people from around the world. The illustrations flow right along with the prose with colors and images that seem to dance across the pages. How does the perspective on gender/race/culture/economics/ability make a difference to the story? This is a book of praise and celebration that begins with the animals and ends with people from around the world all joining hands, dancing feet, and voices. Nationalities are represented in skin color, musical instruments and clothing styles but the focus is clearly on God’s creation and praise for the Creator. Everything and everyone is unified in giving praise to God! Theological Conversation Partners: Psalm 148 begins and ends with “Praise the Lord!” as it lifts up the wonder and miracle of God’s creation and calls all of creation (from heavenly hosts to sun, moon, and stars. to sea monsters from the deep, to fruit trees and cedars, to creeping things and flying birds, to kings, princes, rulers and all people young and old) to worship. Our God is not only a magnificent Creator, but a faithful God as well who has provided the whole of creation for us! How do we respond to such creative power? We leap to our feet and raise our hands and voices in joyous praise! Psalm 150 also begins and ends with “Praise the Lord!” and calls us to praise God with instruments of every description and to dance! King David danced before the Lord when the Ark was being returned to the city of Jerusalem setting before us a lyrical picture of praise and worship that most Presbyterians tend to step back from. But as this book suggests, when we let go of our inhibitions and let the music lead us, we can offer our praise in total abandonment. Children love to move and groove so let them be your guide and SING PRAISE with your heart, loud voices, waving hands, and dancing feet! Read the story of creation in Genesis 1:1-2:4 pausing each time you read the words “and it was very good.” As you pause, stand up, give a twirl, and sing “thank you God” in your own tune. What are other ways you can show God your praise and worship for the wonderful world we have to enjoy? How can you help care for God’s wonderful world? Think about the earth, animals, and people too. Sing Praise by Storypath is licensed under a Creative Commons Attribution-NonCommercial 4.0 International License. Does this book use gender neutral or balanced language for God? Language for God is varied. God is referred to as ‘him’ once in the book, but is also referred to as creator, maker, and by the name God.